The Mortuary operates as RSVP only. Upon RSVP, you will receive address and details. 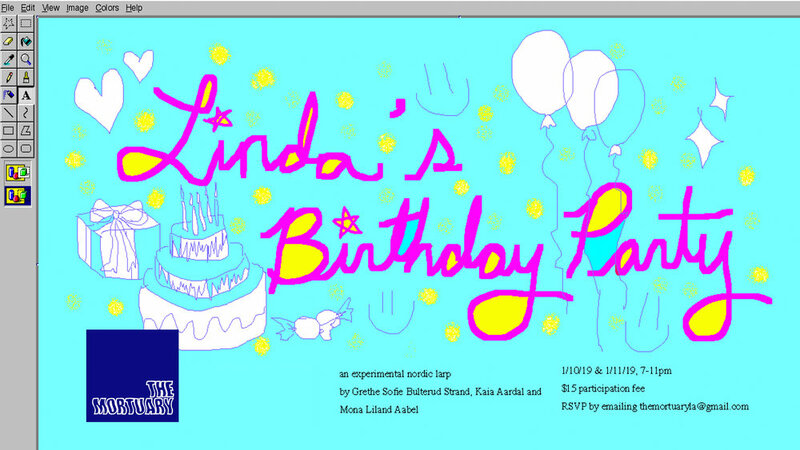 Linda is turning six years old and you are invited to her birthday party! Release your inner child as a 5, 6, or 7 year old at Linda's 6th birthday. Featuring simple pre-made characters, party hats, party games, hot dogs*, candy and CAKE! * We will be polling attendees about actual dietary restrictions and adjusting food accordingly. This is a simple game where the players get a chance to meet their inner child again and eat as much cake as they want. Great for people new to live action role playing (larp), as well as long-term larpers taking a break from weighty worldly issues and world-saving heroics. WHAT IS LARP (Experimental Nordic Style)? Larp, or Live Action Role Playing, is an ancient, global art form where participants have some control over the narrative through a role they embody and enact through improvisational techniques. Nordic larps are often considered to be on the progressive, experimental fringe of larps. Grethe Sofie Bulterud Strand is a Norwegian organizer, game designer and larper. Co-editor of "Once Upon a Nordic Larp...Twenty Years of Playing Stories (2017)." Kaia Aardal and Mona Liland Aabel are Norwegian larpers, organizers, game designers and co-founders of the Norwegian larp group Solgløtt.